In December 2012, in the wake of the Sandy Hook Elementary School shooting, National Rifle Association CEO Wayne LaPierre held a press conference in Washington to present the group’s plan for protecting the nation’s schools from gun violence. LaPierre announced that the NRA was launching the National School Shield Emergency Response Program. “From armed security to building design and access control to information technology to student and teacher training, this multifaceted program will be developed by the very best experts in their fields,” he said. Former Rep. Asa Hutchinson (R-Ark.) would head up the task force, and the NRA Foundation would supply him with generous financial resources to get the job done—“whatever scope the task requires,” LaPierre promised. Last Wednesday, Lori Alhadeff, the grieving mother of a 14-year-old victim of this month’s Parkland, Florida, school shooting, brought up the task force with NRA spokeswoman Dana Loesch at a CNN town hall. Alhadeff demanded to know what happened to all those NRA promises of school security help. “Where are our metal detectors?” she asked. “Where is our bulletproof glass?” Loesch replied that about 150 schools had taken part in the program, but that it was up to the schools to volunteer to take advantage of it. A survey of the NRA Foundation’s grant-making since the announcement of the School Shield program, though, suggests that school security may not be high on the group’s list of priorities. NRA Foundation’s tax returns from 2013 to 2016, the most recent years publicly available, show annual revenues of more than $40 million. It gave away more than $30 million a year, in the form of cash grants and equipment, mostly to competitive shooting programs and shooting range improvements at gun clubs and law enforcement facilities. They also funded youth gun programs in schools, including Army Junior Reserve Officer Training programs and 4-H clubs. Among the hundreds of grants the NRA foundation distributed over those four years, only three are listed as going to schools as part of the National School Shield program, for a total of less than $200,000. All three of them were awarded in 2014. The Montpelier, Ohio, school district received $33,500; the Clarksville, Arkansas, district got $65,000; and the Prince William, Virginia, district got $90,500. Only one—the Clarksville grant—is mentioned on the National School Shield website, which doesn’t list any other school participants. Hutchinson, the head of school shield task force, presented that grant personally in a May 2014 ceremony at the town’s junior high school that was covered by the local TV station. The announcement came about a month after Hutchinson declared he was running for governor of Arkansas. Located just outside the Ozark National Forest, Clarksville’s school district encompasses only five schools and fewer than 3,000 students. But it made headlines in 2013 when it became one of the few schools in the country to arm teachers and school staff with concealed weapons, a favorite NRA remedy for combating school shootings. The district superintendent, David Hopkins, appears in a promotional video on the National School Shield website touting the benefits of the program. 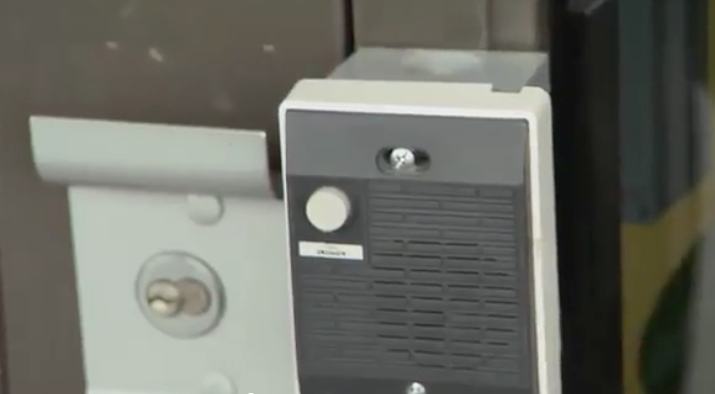 In the video, he says the NRA grant helped “fortify” district school buildings, pointing out a door buzzer one of the schools had recently installed. A new school door buzzer paid for with a grant from the NRA. The grant wasn’t large enough to outfit the district’s five schools with ballistic glass, as the school shield task force report recommended. But Hopkins said in an interview that it did help the district upgrade doors and locks and to apply a film to school windows “so they don’t shatter and fall out” if they’re shot. The Montpelier, Ohio, school district is home to just two schools and fewer than 1,000 students. Like Clarksville, it had decided to arm teachers and janitors with concealed weapons. It’s unclear what prompted the Prince William County schools to apply for or win a school shield grant, but the NRA national headquarters is just a stone’s throw from the county line. Judging from materials on the school shield website and other reporting across the country, the program seems to have evolved into one in which NRA representatives train local officials to assess school security and recommend safety improvements. But the foundation doesn’t seem to be spending much money to help schools implement those recommendations. According to the foundation tax returns through 2016, it didn’t issue a single grant for school security after 2014. Meanwhile, since LaPierre announced the NRA’s task force to fortify the nation’s schools, more than 400 people have been shot in more than 200 school shootings; 138 of them died. No one from the school shield program returned a call seeking more information. But Sheila Brantley, the program director, touted the NRA’s commitment to providing under-funded schools with security resources in a 2015 article on the NRA website.